Dear Dentist, Is Tongue Pain an Emergency? The tongue is one of the oft-forgotten heroes of the body. It helps you speak clearly and enjoy your favorite foods; it’s an important part of the digestive system. But what should you do when your tongue is in pain? Usually, soreness or discomfort on this group of muscles isn’t a major cause for concern; the tongue is a resilient little body part that may be able to heal on its own. However, some tongue problems may require medical attention. Your dentist is here to explain a few situations when your tongue might need a helping hand. Everyone bites their tongue once in a while. It might happen when you’re chowing down on a delicious meal or when you’re playing sports and take a hard hit. The best way to handle an injury like this is to gargle some warm saltwater and be patient. Your tongue may feel better in a week or so. However, if there is severe bleeding or other serious damage, it’s best to visit a medical professional just in case stitches are needed. A canker sore on your tongue or on any of the soft tissues of your mouth can be incredibly painful. Thankfully, though, these usually go away on their own in less than a week. But sometimes they’re more serious than that. If you have a particularly large canker sore or one that refuses to go away, you might need help from a professional. A dentist may use a laser to get rid of the sore or offer suggestions on what medications can relieve your pain and give your body a healing boost. Glossitis is tongue inflammation. There are different types of this condition, and most of them aren’t serious. Still, you may require treatment. One type of glossitis is known as geographic tongue. This is when small, map-like red lesions appear on the tongue. Treatment might include anesthetic mouth rinses or zinc supplements. Your dentist might want to do some tests to make sure the lesions aren’t a symptom of a more serious condition. Median rhomboid glossitis, like geographic tongue, doesn’t pose any threat to your overall health. However, you might experience pain when you’re eating certain foods. An antifungal medication might be needed to help you heal. A tongue tumor might be a sore spot, a lump, or a discolored patch on the tongue that refuses to go away. It can cause soreness and pain. While some tumors are benign, others might be cancerous. That’s why you should seek a professional diagnosis of the tumor as soon as you realize it’s there. In most cases, tongue pain is nothing to worry about. However, you should always keep an eye on this little group of muscles and not be afraid to seek medical attention when you think something is wrong. 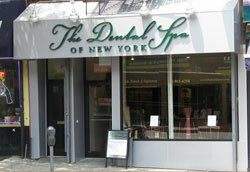 Dr. Frank Sapienza is proud to serve the Brooklyn community by providing top-notch dental care services. If you’re concerned about your tongue or any other aspect of your oral health, feel free to contact our office at 718-965-6298. Comments Off on Dear Dentist, Is Tongue Pain an Emergency?